DO were appointed in March 2018 to transform an empty Ingram Street shell-unit into a brand new salad and coffee bar located in the heart of Glasgow City Centre. The area of the unit measures no more than 30 square metres and therefore created a challenge to incorporate all of the components and spatial requirements necessary for the client to operate. 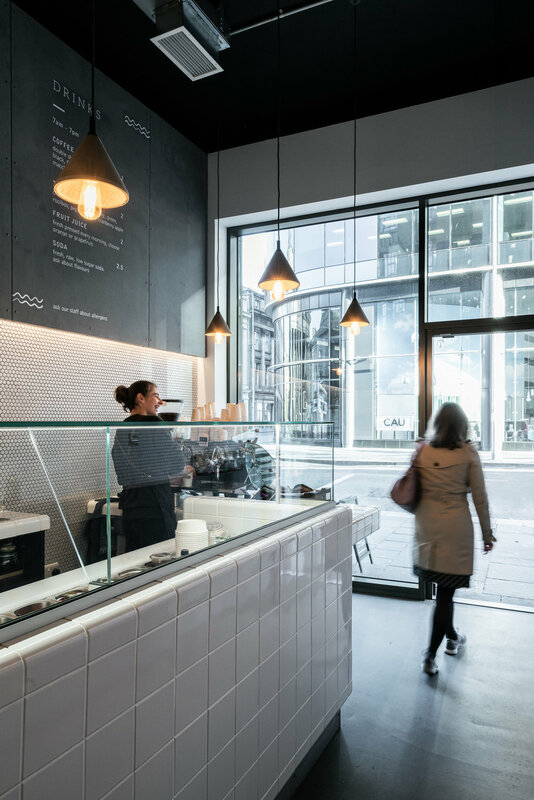 With the majority of the food prepared off-site with salad and coffee available for take-away, the unit required an attractive and functional space where customers can comfortably gather, food can be beautifully displayed and staff can serve in an efficient and practical manner. Our aim was to be keep the material palette simple and contemporary. We played with depth through the use of Marley Equitone fibre cement boards sitting proud of the tiled walls. The tone of the space is deliberately neutral which allows the diverse range of fresh fruit, vegetables and meats provide the only source of colour to the space. How we lit the space was carefully considered; LED strip lights are concealed behind the wall boards to emphasise wall depth and wash light down the white hex-tiles to brighten up the spaces of activity of both staff and customer. Low level Zhong concrete pendants light the carefully crafted curved D-Tile counter and LEDs incorporated within the frameless glass sneezeguard shine warm light onto the food, bringing out its colour. Additional storage and refrigeration space, staff toilet facilities and M&E plant are located outwith the main space accessed through a concealed door integrated into the fibre cement build-outs. Pop along to Sprigg and try out their amazing food and coffee and check out the space while you wait!